Power Up Your Everyday… Every Day with Almonds! Power through your days with the help of almonds as a go-to snack and sidekick. 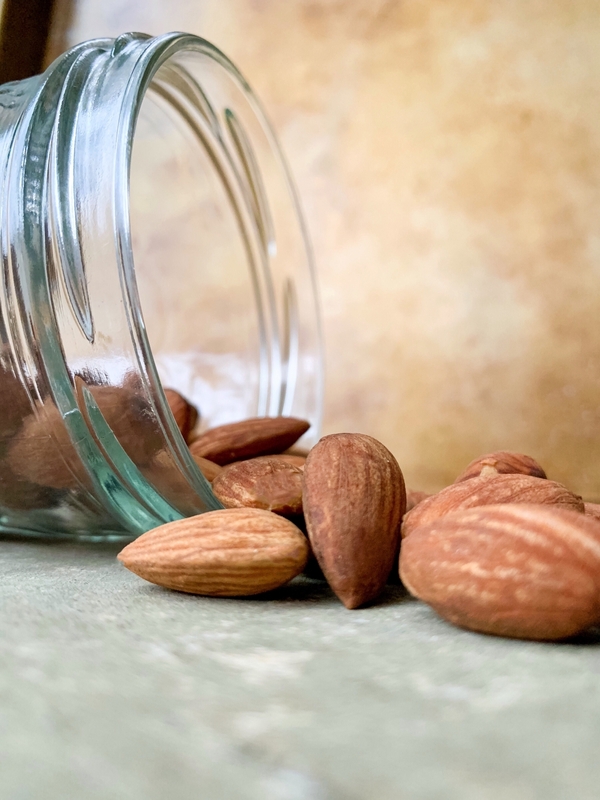 Almonds are a quick, convenient and delicious option for those who juggle numerous priorities and need sustained energy to take on whatever the day throws their way. With 6 grams of energizing protein and 4 grams of filling fiber, there’s nothing you and almonds can’t do! 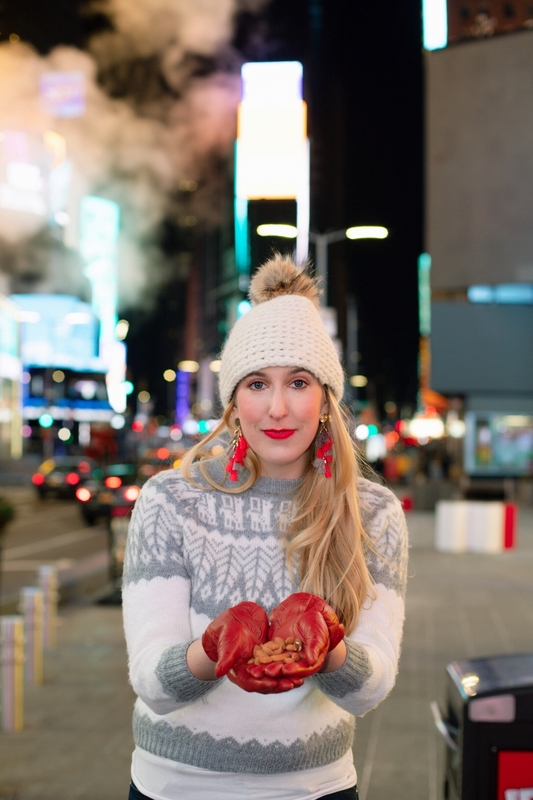 Read on to hear more about how almonds help this Wall Street lawyer turned social media entrepreneur power through her days from the gym to the office to the airport and back again! Please note that this is a sponsored post written by me on behalf of California Almonds. 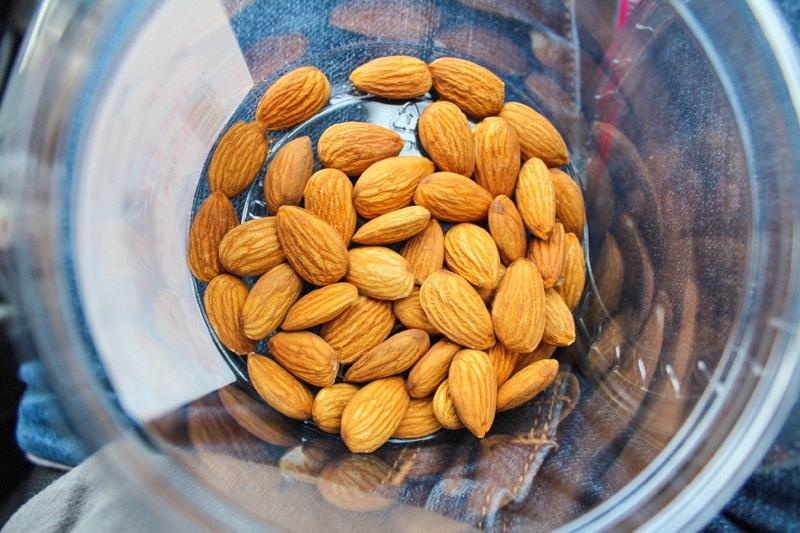 Almonds are the perfect on-the-go snack for busy lives! We’ve all been there…it’s 3 pm and you still haven’t had time for lunch. There are more tasks to be done at the office and if you’re lucky you’ll be able to head out at 7 pm. Then you race over to the yoga studio, before popping by the grocery store in a post-sweat flurry, then eating dinner at 10 pm, watching one episode of your favorite show, answering some final emails from work, catching up on your side hustle, and then finally heading to bed. Or maybe that’s just me? It’s true, I am extremely busy. I am a full-time corporate lawyer on Wall Street in New York City, and have worked at some of the world’s most prestigious law firms. This means working 60 to 80 hour work weeks and being on call pretty much all the time. I also dance in and help manage a professional dance company in New York City. Adding to this, I run a successful social media business, collaborating with travel and lifestyle companies around the world. I also work out 5 days a week, by practicing yoga or going to the gym, and try to sleep when I have time, which isn’t much! But to be honest, I like being busy! And I feel a sense of accomplishment when I tackle many tasks each day. What I don’t like, however, is having my energy crash, or getting grumpy and shaky because I haven’t had time to eat. The unfortunate result is that if I haven’t planned snacks and food in advance, I either don’t eat at all, or simply succumb to whatever is available. This can result in poor decisions that lead to unproductive energy crashes from less healthy foods. My Number 1 Tip to Stay Energized! I snack on almonds between meetings and before workouts. That’s why my Number 1 tip to help stay energized and productive throughout the day is to snack on almonds! Almonds are packed with nutrients like Vitamin E and magnesium, and are a good source fiber and protein. They’re without a doubt the perfect snack that tides me over between meals and everything else I have going on. Indeed, I snack on almonds between meetings and before workouts, and pack them in small resealable bags. I carry these homemade snack bags with me in my purse and laptop bag and snack on them on-the-go and at the office. 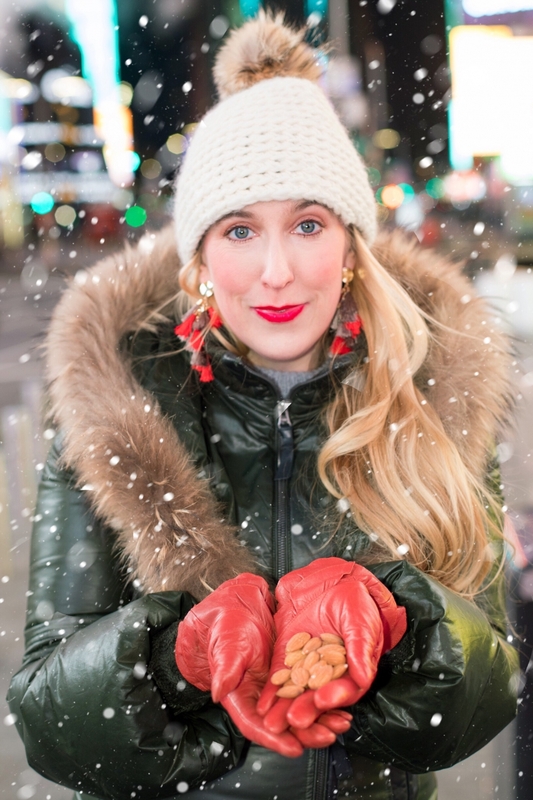 I’ve even been known to snack on almonds while touring my family and friends around New York City! I love that almonds are convenient and easy to carry, so I can enjoy them anytime and anywhere! Pack almonds in resealable bags to take with you on-the-go. 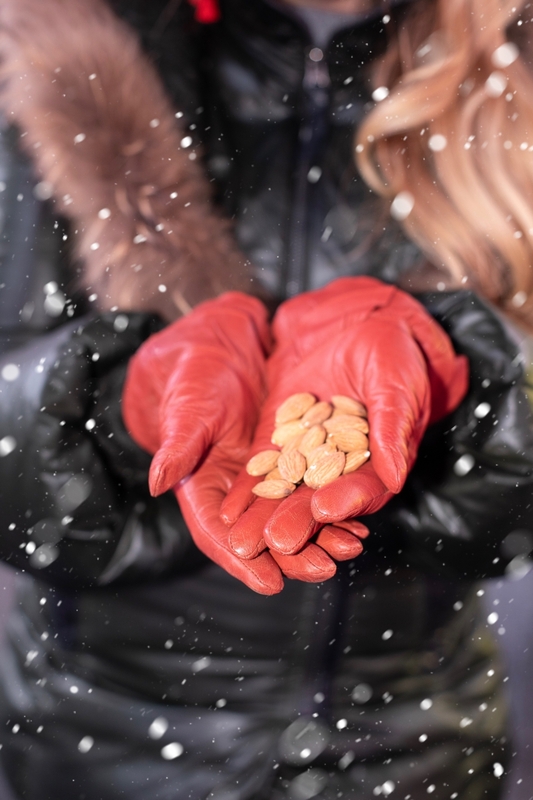 I also take almonds with me when I travel since I frequently do fitness-centered travel, such as hiking and snowboarding, during which I need steady, sustained energy to conquer the task at hand. While completing a 4-day trek in the jungle in Colombia, I had packs of almonds in my backpack to keep me going. For this, I needed the kind of sustained energy that almonds provide. In other cases, I pack almonds with me when travelling to locations with limited access to nutritious and convenient snacks, such as my trip to the Sahara Desert last summer. After a day of riding camels over 100 foot sand dunes, I was grateful to be able to reach into my backpack to find an almond snack to crunch on for sustained energy to help me make the most of my journey. Almonds are the nutritious, convenient snack that gives me energy to take on whatever the day throws my way. Indeed, almonds are a good source of protein and fiber, as well as good fats to keep me feeling energized and satisfied all day long. How to Incorporate Almonds into your Daily Life. Homemade almond milk can be made with any high-speed blender. Almonds are my Number 1 tip to help stay energized and productive throughout the day! Pack almonds in small resealable bags and put them in easily accessible locations. I’ve got almonds in my desk drawers at work, in my gym bag, in my laptop bag, and of course, at home. When I travel, I bring them in my backpack for a snack on the plane. 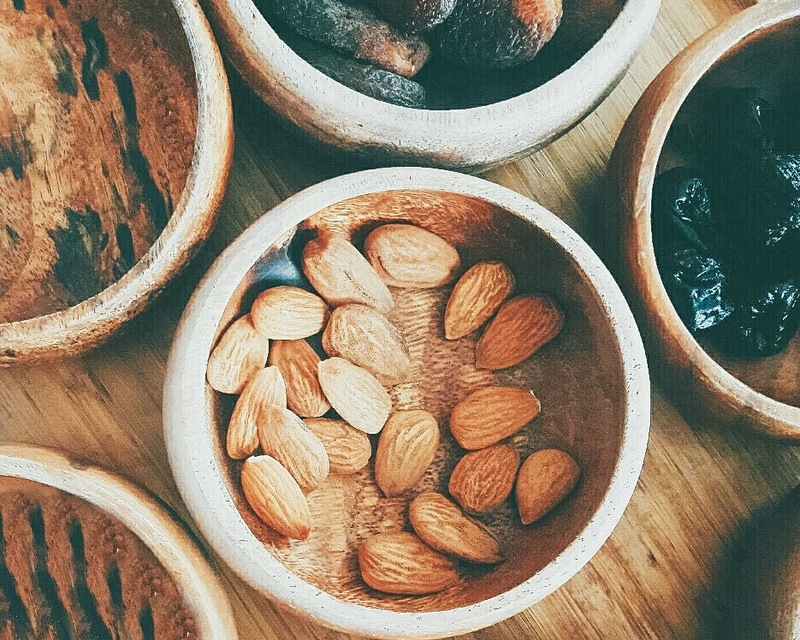 Almonds taste great on their own, but I like to make a little homemade trail-mix by adding in raisins or other dried fruits (but make sure these aren’t too high in sugar). In addition, as I am lactose intolerant, almond milk has been my key source of calcium for years now, but what I’ve only recently started doing is making my own almond milk! While I love the convenience of store-bought almond milk, making it myself allows me to control the amount of sugar and I can also infuse new flavors as well as adjust the liquid’s thickness. I have a machine that’s specifically made for grinding almonds into almond milk, but this isn’t necessary. Any high-speed blender will generally suffice. After that, it’s just water, almonds and a pinch of salt, and you’re on your way to homemade goodness! Almonds have tons of health benefits! In terms of health benefits, almonds are an excellent source of Vitamin E, manganese, and magnesium. Getting plenty of vitamin E from foods is linked to numerous health benefits, including boosting your immune system; while magnesium is required for muscle and nerve function, blood glucose control, and blood pressure regulation. Almonds are also high in unsaturated fats, the good fats. Indeed, according to the U.S. Food and Drug Administration, “Scientific evidence suggests, but does not prove, that eating 1.5 ounces per day of most nuts, such as almonds, as part of a diet low in saturated fat and cholesterol may reduce the risk of heart disease.” Last but not least, almonds are a good source of fiber and protein. Plus let’s be honest, almonds are also incredibly tasty! 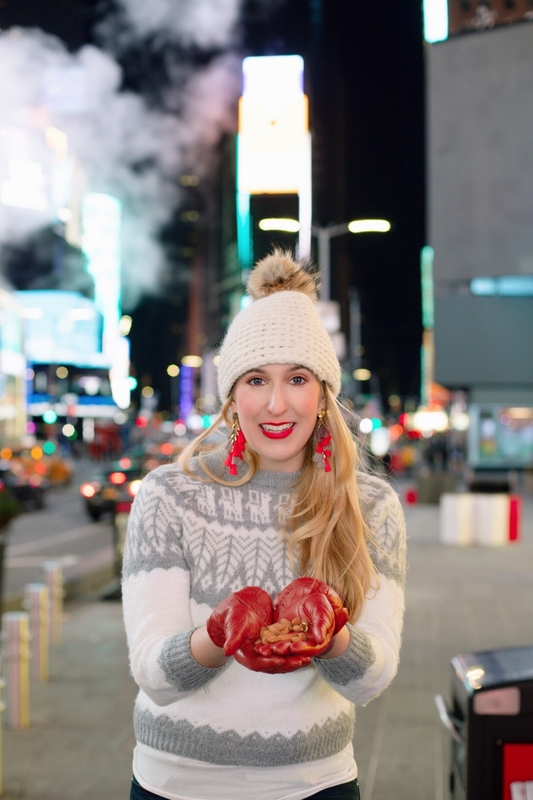 Just out enjoying some almonds in Times Square! All in all, almonds are the perfect snack for anyone who is on-the-go like me and looking a snack to stay energized between meetings, pick-ups, and workouts. With demanding jobs and busy lifestyles, we need something healthy with enough nutrition to keep us going all day long. And if it’s not convenient and easy to carry, it’s probably not going to become part of our day. But almonds are all that and more, providing a convenient and healthy snack to take along with you throughout a busy day. Whether you need a late afternoon dose of energy, or are fueling up as part of your exercise routine, almonds are a healthy snack you can eat on-the-go, at the office or while travelling. Let’s Get an Almond Emoji! And one last thing before you head back out to your busy day! The emoji trend is here to stay, and people are embracing emojis as a fun way to communicate about food. From avocados to tacos and everything in between, smartphone users have many options to express their love of their favorite foods. But without an almond emoji, almond lovers like us have been left out of the conversation! Join the #AlmondEmoji movement and sign the petition here to help make our almond emoji dreams a reality! Let’s get an almond emoji today! 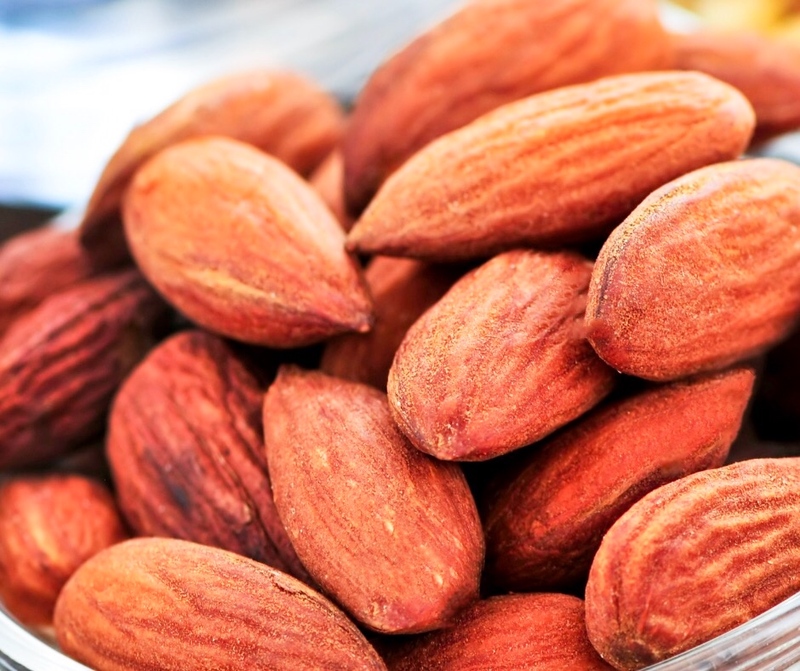 Try almonds as a convenient and healthy snack to support your busy lifestyle! A New Year’s Eve Night In! © 2019 Eileen Rhein. All Rights Reserved. Next Post Alove: The Japanese-Style Aloe Vera Yogurt You Have to Try! Thanks very much! I’m happy you enjoyed it! Thanks very much! I’m so happy you enjoyed it! Great description of a healthy snack and ways to use it. I’m sold on almonds! And how about an emoji? Suits me! Thank you very much for the kind comments! I really appreciate it! 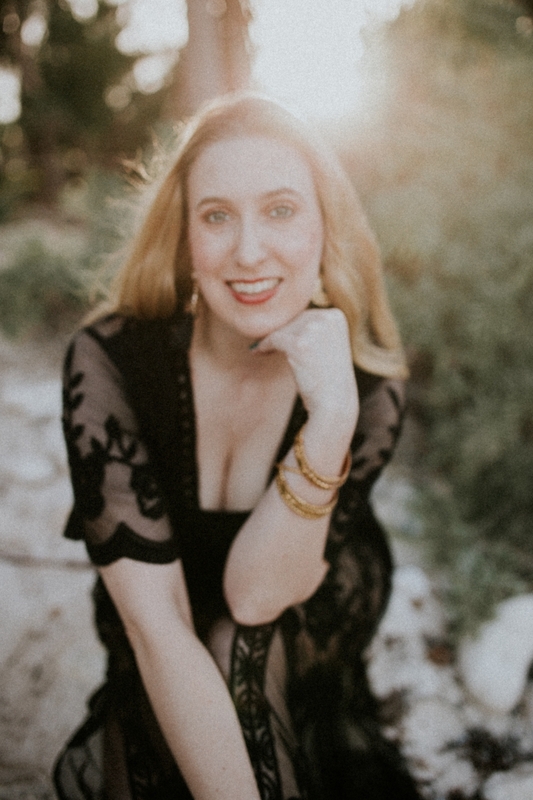 Hello, Thank you for the comment: “I want to ask how can I be consistent and have good content like this.” I think it’s a matter of scheduling time in your schedule each week and sticking to it! Good luck! Thank you! I am glad you enjoyed it! That’s very kind of you to say! Thank you!